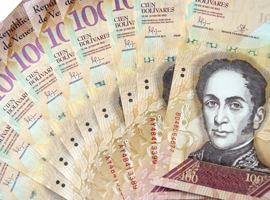 The Central Bank of Venezuela has confirmed that banknotes from its new re-denominated currency will start circulating on 4 June 2018. The news was confirmed by the Central Bank of Venezuela in a press release issued today. News of the new denominations, which will have three zeros removed from each denomination’s value, was announced last month by President Nicolás Maduro Moros. Consequently, what was Bs. 1,000 old bolivars will become Bs. 1 new bolivar. An additional eighth denomination will be included in the new series, consisting of the Bs. 2, Bs.5, Bs.10, Bs.20, Bs.50, Bs.100, Bs.200 and Bs.500. The Central Bank has spoken of the designs of the new banknote family, saying the front of the notes will feature characters and heroes of the Nation whilst the reverse will feature Venezuela’s natural landscapes and fauna. Read the Central Bank of Venezuela’s press release.